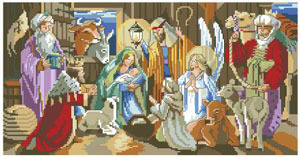 The story of Christ’s birth is depicted in striking detail in our favorite Kooler designed adaptation of the Nativity. The three wise men are present along with the animals who gathered to celebrate the birth of a new king. This Nativity is a lovely reminder of the “reason for the season”. The unique versatility of this design is that it is suitable for those who wish to needlepoint or cross-stitch. Contents: Stitch Count 216w X 112h, Finished size on 14ct: 15 1/2" x 8"